Begin your journey in the vibrant New Orleans, also known as the Big Easy. Culture and arts abound around every corner of this unique city. The open air artist colony proudly displays local works on the iron fence in Jackson Square, while the city’s 45 museums carefully preserve its rich history. Experience the wonder of Baton Rouge, Louisiana's capital city, one that is rich in culture and heritage. Known affectionately as the Red Stick, Baton Rouge is home to legendary Louisiana Cajun cuisine, fascinating plantation tours, and a variety of attractions and events. There is everything you would expect to find in a state capital, but with a down-home flavor that is part of its seductive charm. Baton Rouge is a destination with true Southern hospitality. Let us give you the grand tour of one of the most historic, vibrant and unforgettable cities in the South. This quaint southern town is filled with simple pleasures and unique treasures. 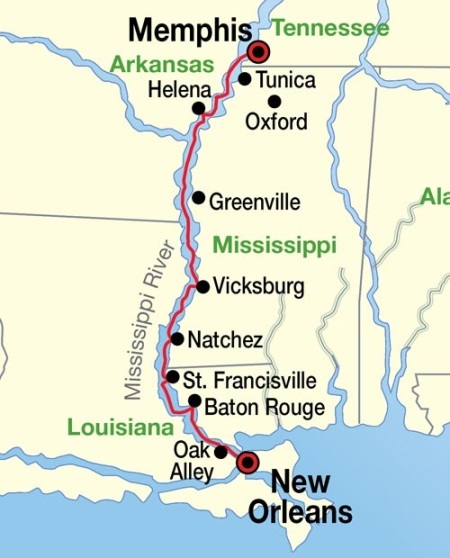 Located on the bluffs of the Mississippi River, St. Francisville has been called “one of the 200 most beautiful small towns in America.” During your New Orleans river cruise stop in St. Francisville, taking a stroll through its historic center awakens an awareness of history with two centuries of architecture and lifestyles. Nearby plantations beckon you back to a time when coquettish southern belles and their chivalrous suitors sipped mint juleps on the shady porches of these grand estates. Delight in the sounds of Jazz and Blues that fill the air as we cruise the Mississippi River and pay tribute to the musicians and the regions that helped influence music in America. On this theme cruise, enjoy special onboard performances, guided shore excursions to influential destinations, and exclusive behind-the-scenes tours of museums and recording studios. Learn about the importance of New Orleans to the birth of Jazz and how Memphis played an instrumental role in the foundation and popularity of Rock n' Roll.